* This review contains spoilers for the previous book in the series, Unspoken. To Sum It Up: With the magical link between them cut, Kami and Jared no longer know each other’s thoughts. However much Kami believed she might welcome being alone inside her head for the first time in her life is almost entirely dampened by Jared’s anger over her decision to sever the bond. Meanwhile, Rob Lynburn and his followers are ready to revert Sorry-in-the-Vale to its past, in which the Lynburns ruled over it absolutely with their magic. Kami is determined to stop him, even without Rob’s numbers and the combined magical might behind him. Review: I survived another Lynburn Legacy book! Let me tell you, things were looking pretty dicey following that soul-crushing ending of Unspoken. Never have I simultaneously loved a book and wanted to fling it across the room in such equal proportion. 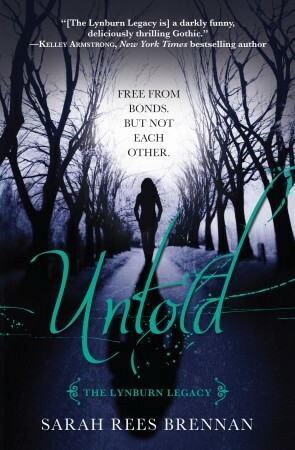 So it was with immense, and I believe totally justified, trepidation that I finally cracked open my copy of Untold. I’ll get straight to what I wasn’t so keen about in Untold so I can spend the rest of the review gushing about what I loved. Surprisingly, the ending didn’t leave me too wrecked. Oh, it was upsetting for sure, but I’d anticipated much, much, worse. The thing about Untold is, it feels a bit too much like a middle book. It gets off to an awesome start with some homicidal scarecrows (! ), but then there’s no real action until towards the end. In between, the novel focuses on the terrible awkwardness , and that’s probably phrasing it lightly, between Kami and Jared now that they’re no longer connected to each other. Jared is very angry at Kami, which sometimes gets to be too much for her and then she gets angry at Jared, and so forth. While I still love both characters and realize that theirs is an extremely unique and complicated relationship because of their now broken bond, I would have been okay with a little less Kami/Jared post-link fallout. With that out of the way, it’s time for the gushing. This book—the hilarity! I chuckled my way through Unspoken, and I chuckled my way through Untold (Jared Lynburn: tavern wench. HAHAHA!). The characters just have this knack for saying the quirkiest things at the most unexpected times, and I simply LOVE IT. It’s as though this series knows exactly what I find humorous, nay, hysterical. During one exchange between Kami’s father, Jon, and Jared’s aunt, Lillian Lynburn, I couldn’t stop laughing. Out loud. I hardly ever do that while reading, but here’s a series that has made laughing out loud a rule rather than the exception. I’ve grown very fond of Kami’s little group, and I was happy to reunite with all of them. Her best friend, Angela, is an absolute riot, and she’s in top-notch, nap-loving form in Untold. I also love Angela’s brother, Rusty; he’s so mellow (i.e. the polar opposite of his sister), yet quite observant. We also get a deeper sense of how far from easy life is for the other Lynburn lad, Ash. His father Rob is an evil sorcerer, mother Lillian perceives him as weak, and even cousin Jared isn’t very nice to him. I found myself feeling sympathetic toward Ash, especially given how his ice-queen mother treats him. Although Untold didn’t quite match the spark of Unspoken for me, nonetheless it was a highly entertaining read. The wit that utterly charmed me in the first book continues to be a delight in the sequel. And in a series that seems to revel in maddening heartbreak, you have to cherish every instance of humor you can get. All in All: Unspoken is still my favorite in the series thus far, but Untold is not without its moments. I do, however, think that it could have benefitted from some more action through the middle, instead of saving it all for the last few chapters. I was a bit disappointed with this book after the awesomeoness of Unspoken, but I think it's down to what you said - that this feels like a middle book. I'm hoping the last one will be mind-blowingly awesome. But despite that, and the humor and the characters made this a fun read. I love the author's writing style so much! I love all of the humor in this series and how quirky the characters are. Angela and Rusty are like champion nappers, lol. I'm reading Unmade now, and I do think both the action and pacing have picked up from Untold. I'm a little nervous about how it's all going to end, considering how the previous two books did!